Lately, I've been experiencing several bumps in the road that feels like my glass is half empty. It's funny how everything happens around the same time. I know it takes time and patience to get through difficulties and challenges but, I sure cannot wait until I get there. I'm getting the feeling that misery may love company but, nobody likes a Negative Nancy...literally! To that end, I'm putting myself on a trajectory towards better and happier things. People say that if you think positively, then things always look and feel better since you're seeing the good in everything. My first step towards this is to start literally with this "Happy Project" t-shirt from Uniqlo. It's an oldie but such a goodie. It already put a smile on my face and that's a big deal! How are things for you lately? Absolutely adore this outfit! You look gorgeous. I know what you mean about getting into a rut, I've definitely been in and out of one lately myself, gotta try to keep a positive attitude though, right? Never heard of the happy project tshirt but it looks awesome! love your accessories...super cute outfit! I love your printed pants! I really like them tucked into ankle boots. I've never thought of tucking pants into ankle boots! Hope that things look up soon! I know how hard it is to wait for things to get better, but I've experienced that they always do--even if it takes a while to get used to the changes that time brings. 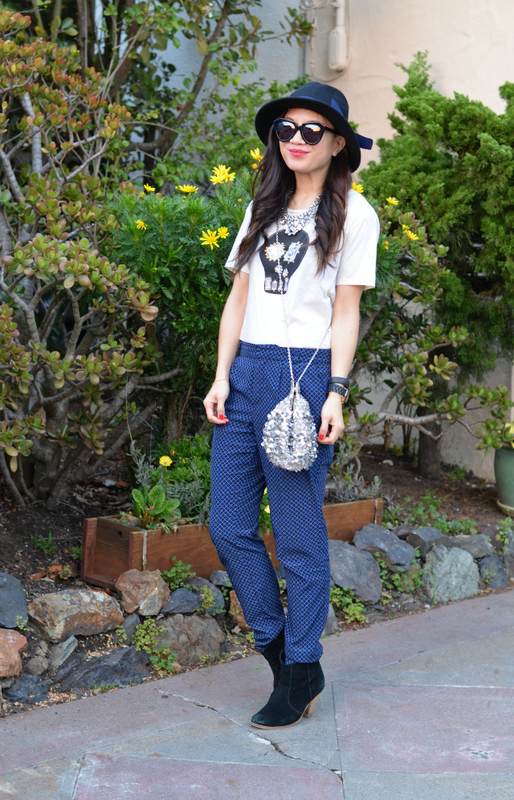 I love the skull tee and printed trousers! It's such a pretty bag! i've definitely been "there", but keep your chin up! i recently started running (training for a marathon) and the workouts really give me a nice boost...i feel good and can see subtle changes in my body, and that puts a smile on my face! love the tee!! I love the tee and the handbag. I always figure as long as I've got my health everything else will fall into place. 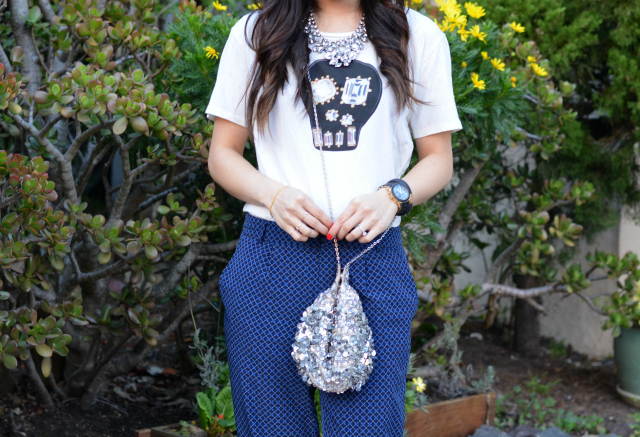 love love love the pants, and the graphic tee ! A cute t-shirt look and a good reminder for myself to be more positive. Nancy, this outfit is awesome! It made me smile. Love it from head to toe girl. I love blue & black together and the sparkle is such a pretty touch. 2014 has been a headache for me so far. I don't what is going on. LOL Nothing bad. Just everything is so hard & difficult. I'll pray for you and you pray for me girl. HAHAHAHA Hang in there. 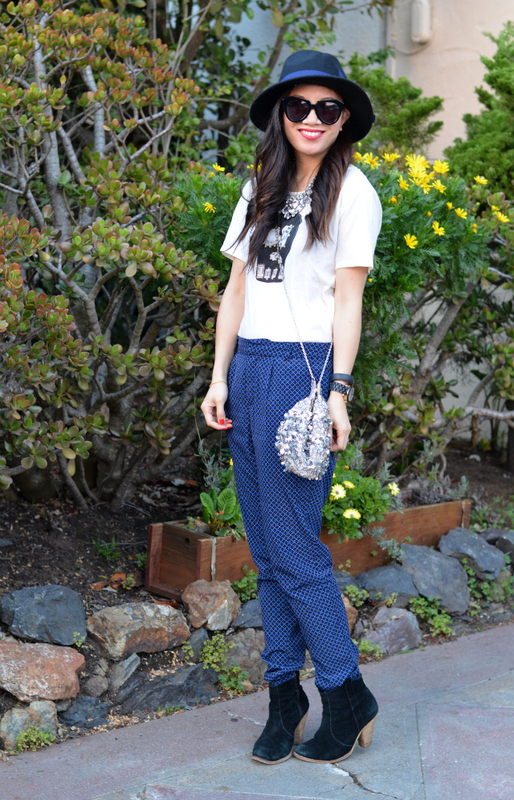 Love how you paired the graphic t-shirt with the polka dot pants! This is such a cute look on you. i love the shirt and any movement that is all about spreading happiness :) i didn't know there was literally a term "negative nancy"! We all get into slumps, it's only natural. But it's always good to remember the positives in life! You look great, love the tee.